Yep! It's finally time for a rooting-tooting roadway pursuit for skip-tracer, Tommy Nowak, one involving a pretty dame, a bunch of Nazi’s, a load of cash, and a pink car. Plus do you know what else? This is all brought to you by Director: Buddy Van Horn; with Actors: Clint Eastwood and Bernadette Peters. It was made in 1989, and has a total running time of 122 minutes.Cool beans. 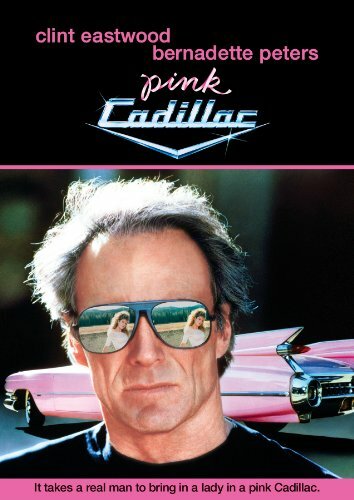 What would you do if you were the skip-tracer, Tommy Nowak (Clint Eastwood), and you just managed to capture your beautiful young target, Lou Ann (Bernadette Peters), with a sack load of money, and a pristine conditioned Pink Cadillac? Huh? What's that you say? You'd help Lou Ann retrieve her baby from her sisters place? Despite her husband, Roy (Timothy Carhart), being a member of a Nazi klan, who she stole the money from in the first place! Nah! I wouldn't do that, pal. I'm sure Roy plus one of his pals would beat you to the punch. Prompting Tommy to do what he does best, and attempt to swap cash for kid. Well, Tommy is a skip-tracer you know, and he can outsmarts them with every single move they make. For example, he can tracks down the general location of the klans base camp, by finding a forged ID in the glove compartment of the Pink Cadillac. 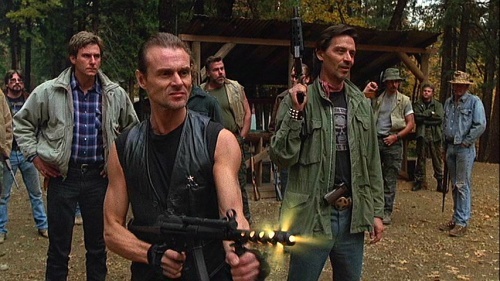 Then, he can show it to the forger of said ID, Ricky Z (Geoffrey Lewis). who will inform him where to go to penetrate the camp in question, and piss off the head of this group, Alex (Michael Des Barres). Still, that's most probably why what next transpires all kicks off when things don't go according to plan. As baby's go boom - klans go doom - attacks go zoom - and at the end of the day adventures really do bloom. I am afraid to say that 'Pink Cadallac' is what I would call a mixed film. No. Not in plot. As that’s pretty simple enough. The basic premise is about a bounty-hunter who has to find a pretty-prey – bounty-hunter finds pretty-prey – bounty-hunter feels sorry for pretty-prey and helps her out – hunter and pretty fall in love – and, they... errr... do ‘something’ together to cement their relationship – the end. Simple right? So what is so mixed about it then? Again. Somewhat simple. The acting. Whenever Clint or Bernadette are on screen together – this is good. But whenever anyone else is on screen, with only one or two minor exceptions – this is bad. And the bad in this case has to do with the bad – the bad-guys! They're just sh*t! I was more scared that they actually got a job in the film industry than how they performed on screen! It’s as if they inhabited the keystone cops whilst pretending to be macho and gruff. OK – OK – OK, I don't want to be too critical. It’s just that’s precisely what this film is lacking – a decent protagonist who can make you generally worry about the situation that Clint’s and Bernadette’s characters are in. Also, another thing that is also a bit ‘off’, is Clint’s mimicry skills. Well, when he has to throw his voice whilst pretending to dupe a suspect into capture... ermm... it just does not sound right to me. Still, whilst saying that about Clint, all in all this latter point is only a minor quibble really, and generally speaking both Clint and Bernadette are the two main reasons to watch this film. Plus Bernadette’s other more womanly attributes of course, WOOOF-WOOF! Good film, sloppy in places.